If you’ve been neglecting to get your septic system pumped, cleaned or accessed for some years you might be in need of septic system repair. Many times there will be clear signs that your septic system is failing, from standing water in your yard to smelly pipes, slow draining sinks and in some cases actual sewage will come up from the system and into your home. This is major reason for concern because there is a long list of health and environmental hazards related directly to failing septic system and the issue can contaminate your water supply and other, local areas as well. 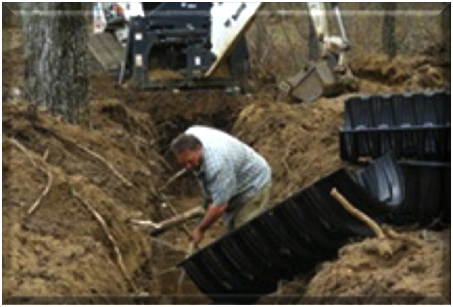 Custom Septic Inc., located in Big Lake, MN and Menahga, MN offers you expert septic repair and replacement services. Imagine you fill your tub with water and then drain it. At the same time the water is running down your drain into your septic tank, the exact amount is running out of the tank and into your septic system’s drainfield. This happens with each and every drop of water that flows down your drains and into the ground, where your septic system is located. Because a septic system is depended on so much, a failure can be easily be noticed if you know what signs to look for, on the other hand a septic failure can turn into something extensive and dangerous if the signs are overlooked. To Repair or Replace Your Septic System? Custom Septic Inc. is dedicated to providing Minnesota property owners with cost effective solutions that will save you time and money for years to come and also keep everyone safe. We will evaluate your septic system and determine the best solution for a safe, well working system that you can depend on. It is important to hire a professional to resolve your septic issues, decomposing waste emits toxic gas and can be lethal to humans, animals and the environment. Contact the licensed and certified septic system repair professionals online or call us at (763) 218-4769 for the Big Lake, MN and Menahga, MN area today.